Civil Unions, a critical step toward full equality for committed LGBTQ couples across Colorado, suffered a minor setback last year when it was killed in special session. Citizens Project supporters joined with partners and activists statewide to promise that justice will prevail. 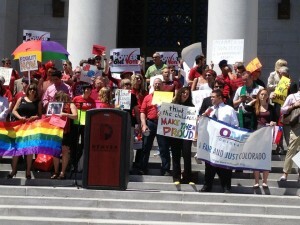 And the time is now to help civil unions pass the Colorado Legislature. The Civil Unions Bill – SB11 – has been scheduled for Wednesday, January 23rd before the Senate Judiciary Committee at 1:30pm in the Old Supreme Court Chambers at the State Capitol. You’re invited to join statewide allies for the first step in securing civil unions in Colorado this year. We will be wearing red! If you cannot attend this first hearing, please consider sending an email to the Senate Judiciary Committee or filling out a postcard expressing your support today. As always, you can count on Citizens Project to keep you apprised of opportunities to speak out in support of civil unions and other important legislation impacting religious freedom, equal rights, civil rights, and civic engagement. No Replies to "Take Action to Support Civil Unions in Colorado"